Rental Applications are also available in our “Main Menu” under "Online Forms”. Pictures of the pavilions are posted at the bottom of this page. Locations of pavilions, soccer fields, ball fields, skate park, playgrounds, restrooms, parking areas, etc. or look on our “Main Menu” under “Forms”. Pictures of the pavilions are posted at the bottom of this page. Park Directions to Pine Hill Recreation Area. In view of the growing popularity of Red Run Park, and the limitations imposed by the lack of space to enlarge the park, the Township Supervisors in 1992 purchased a 150-acre tract of property which encompasses the mountain above Red Run Park. Although the parks are technically connected, the area of the connection is extremely steep and does not make movement from one park to the other feasible. 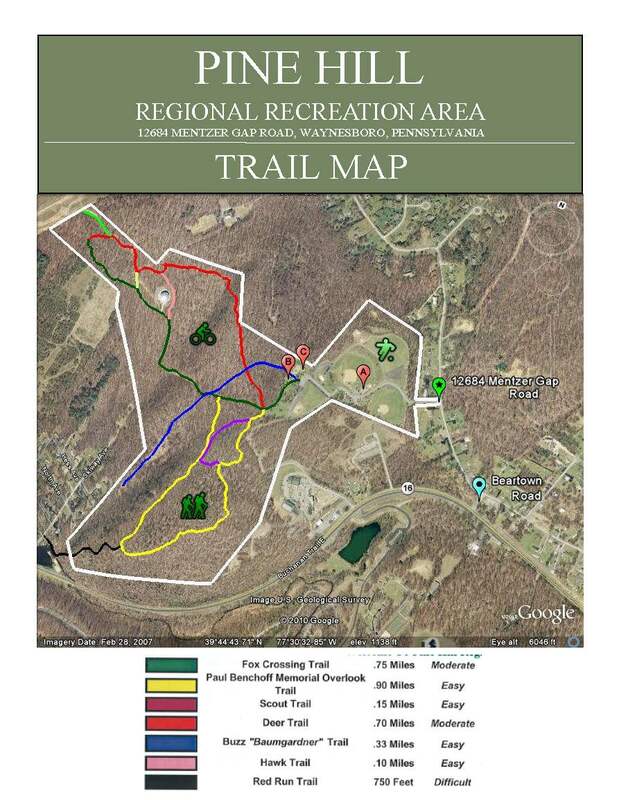 Therefore, the decision was made to develop the Pine Hill Regional Recreation Area separately from Red Run Park and utilize it as regional park. Work progressed slowly on the new Recreation Area as funds and time became available and as volunteers donated time and effort. 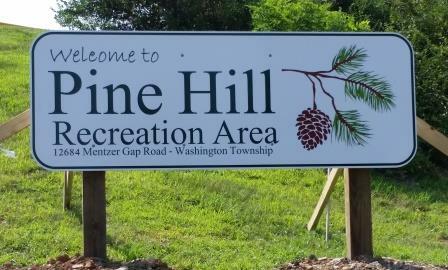 In 1997 the Township opened Pine Hill for use. The Waynesboro Teen Baseball League completed the pony league field and started league play. The little league field was completed by the Township and is being made available to the area leagues on a rotating basis. Approximately two miles of hiking/walking trails are open, providing a beautiful view of the Cumberland Valley . A wheelchair accessible trail is partially completed. Except for the ball fields, this Recreation Area is wooded and has never been developed in any way. Public water and sewer have been extended to the area and a concession stand is planned for the near future. In late 1997 the Township, with the assistance of a State grant, retained the services of Rettew Associates to complete a master plan for the future development of this park. Washington Township purchased this property to provide for the recreational needs of the Township and area residents for the next half-century. Based on present growth, this seems a reasonable expectation. Pine Hill Regional Recreation Area is a 174-acre recreation area owned and operated by Washington Township with a variety of recreational activities for residents and visitors. Located in the southeast corner of Franklin County, the park abuts Red Run Lake & Park, and is just a stone’s throw away from the Michaux State Forest. The park contains seven hiking/biking trails which total 3.04 miles. From the trails one can overlook large portions of the Township and watch the sunset. Pine Hill offers top-of-the-line picnic facilities with excellent vista views to accommodate those from all walks of life. Three pavilions grace the landscape, along with a gazebo and 2 mini-pavilions. Restrooms are also available year round for your convenience. A pony league baseball field, softball/little league field and a soccer field are in place for use by local leagues as well as visitors. Other recreational facilities include 2 state of the art playgrounds, horseshoe pits and a sand volley ball court. A brief history of the Park: The area was consolidated from several tracts of land in the 1930’s. After these tracts were combined, they formed a 140 acre piece of property; other land was added since 1992, making up what today is a 174 acre park. The area was logged only once from 1930 to 1990. Although the timber was removed, the area remained uninhabited. In 1992 the Township purchased the land to create a park. Approximately 17 acres had been clear-cut by the previous owner. This area was terraced and became the play fields. In 1999 a joint effort between the Township and the Pennsylvania Department of Conservation and Natural Resources, resulted in a master plan for development of the park. By 2002 the park contained 2 baseball fields, a volleyball court and a soccer field. These fields now service some of the areas Little League and Pony league Baseball teams, as well as girls’ softball teams. After completing the play fields, the pavilions and playgrounds were installed. Over 3 miles of trails were placed in the wooded area, and heated restrooms were installed for year round use. Future plans include a skate park and mountain bike trails. With ongoing improvements Pine Hill will continue to be an outstanding recreation facility.